It doesn't seem 5 minutes since we were looking ahead at the Summer Holidays way back in July but here we are in September. I had two aims at the start of the 6 weeks - to have fun, and to try not to spend much money! I probably spent more than we should have but we certainly had lots of fun! We are really lucky to live on the South Coast and we are spoilt for choice with beaches. Although saying this, we never go to the beach!! I'm not a fan of sand and the big beaches are always packed in the Summer but I made sure we had at least one beach day over the hols. We stayed local and went to a small beach that is nice and shallow for paddling. We met up with some friends and the kids had a great time! One thing though, why is it never possible to travel light to the beach?! I had picnic bag, picnic blanket, a camping chair, bucket and spade, child, beach stuff, various dinosaurs..!! 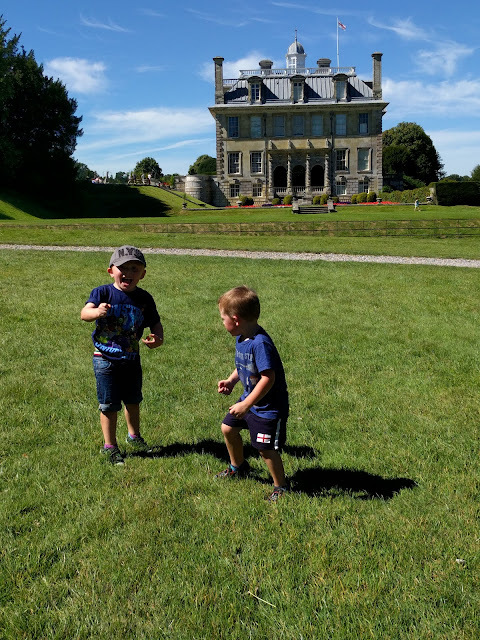 I've written about Kingston Lacy before on my blog but it is one of our favourite places to go in Dorset. It's a stunning stately home with beautiful grounds to explore and is owned by the National Trust. We are NT members so it's a great place to go for a cheap day out with the kids! We visited on a boiling hot day and we had a lovely picnic in the shade of the giant oak trees next to the house. We then wandered down through the estate to the Kitchen Gardens where you can find allotments, pigs and plenty of ride on tractors to entertain small ones! There's a little kiosk selling ice creams and drinks and these were certainly appreciated on such a hot day. Celebrity Stalking - A List Style! I used to love a bit of celebrity stalking in my younger years....Boyzone, Jared Leto, Ant & Dec...um Peter Andre! 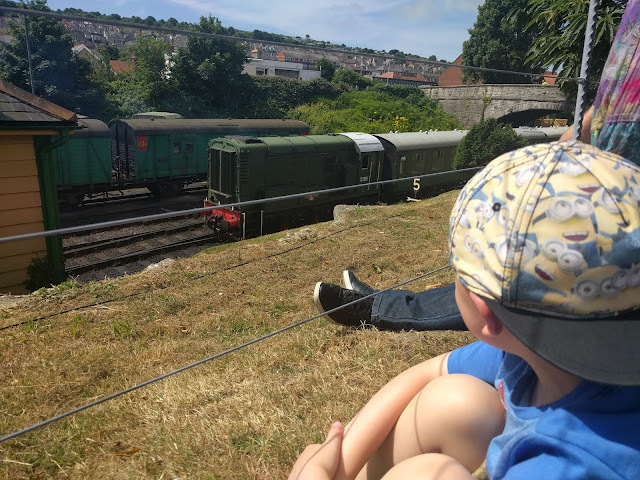 Being a Mum it's usually limited to CBeebies presenters these days but over the Summer I found out that a new film was being shot in Swanage which is around half an hour from where I live. In that film were a couple of unknowns called Tom Hardy and Harry Styles, I doubt you've heard of them! ;) I'd been planning a day trip to Swanage so we thought we'd combine the two and see what we could spot. Not a lot happens in sleepy Swanage so it was a big deal! The majority of the filming was taking place at the railway station so we headed there and had a nosy around. The kids enjoyed looking at the trains while we tried hard to not make it look like we were on stalking mode!! We spotted some paparazzi so my friend managed to climb a wall (wearing a dress I might add!) and she did get a glimpse of Harry Styles! Apart from the wall climbing, I thought we were being quite discreet (not like some of the shouty 1D fans we saw!) but then I came home that evening to find we'd been filmed for the local evening news......cringe!! We have some really great parks near to where we live and we spent lots of time there over the Summer holidays. 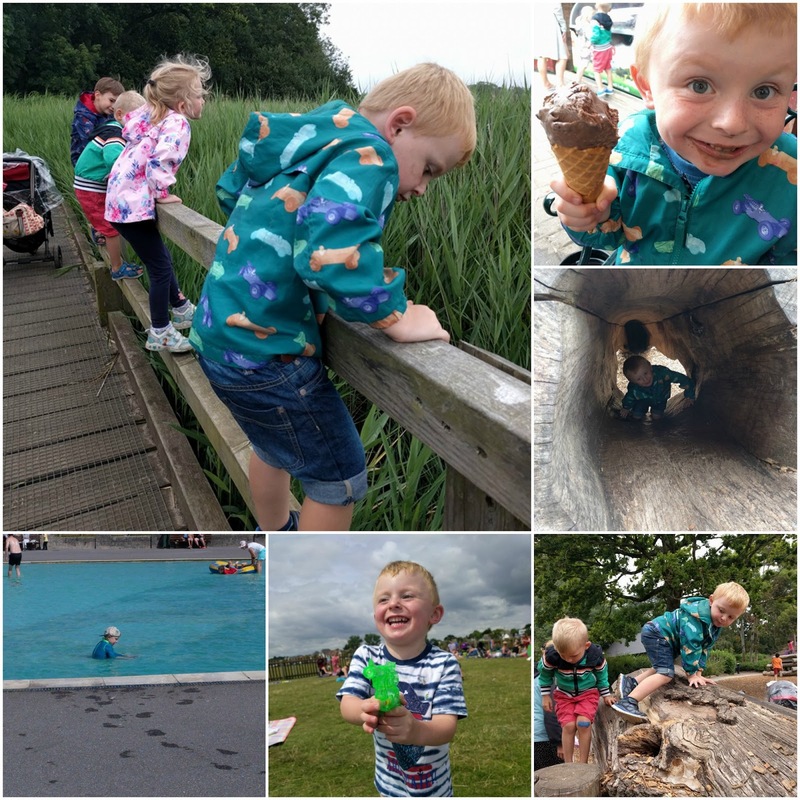 We have a brilliant country park just down the road which has lots of nature walks, things to climb on and in the Summer there are splash fountains which we have enjoyed lots over the Summer - good for cooling down on a hot day! We actually visited on a few rainy days too rather than being cooped up indoors. They also do amazing ice creams! Our other favourite park has a big paddling pool which Elliot loves and we've visited on numerous occasions over the last few months - sometimes it's hard getting him out of the water though!! To keep costs down we've had lots of days at home and the paddling pool has certainly had a battering!! We moved house last year and our bungalow has a lovely little garden that catches the sun just right so it's perfect for playing in. The slide was a new addition and Elliot loves nothing more than hurtling down into the paddling pool! What did you get up to over the Summer Holidays? Tom Hardy?!!! I got very excited when I saw that! I'd have been totally over excited if I'd seen him! I love your slide into the paddling pool in the garden-that must've given you hours of fun! I totally agree about the beach and travelling light-I feel like I'm carting the entire contents of my house with me whenever I go! 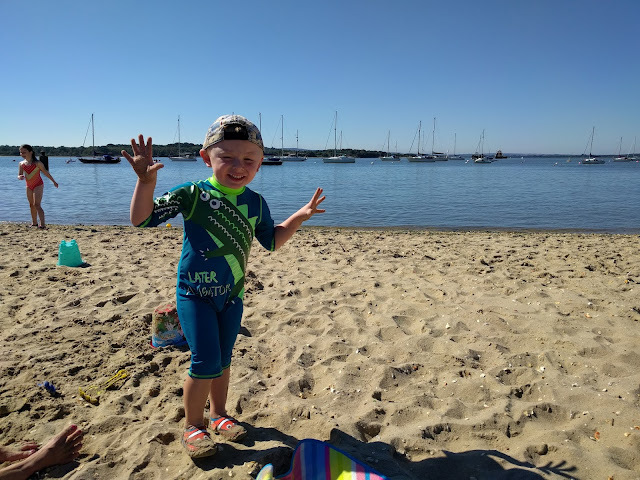 We had lots of beach visits over the summer-our children have been too little to really enjoy it before now, so it was nice to see the playing in the rock pools and being interested in building sand castles!